Helping others can be very satisfying but also challenging. This course aims to provide some basic tools to guide and support those who are involved in helping work. The topics to be covered in the course include: theory and practice of Buddhism (all traditions), what it means from a Buddhist perspective to help or ‘offer service’ to others, the limits to helping, basic counselling skills (especially listening skills and effective communication), common mental health problems encountered in the community, suicide prevention, and self-care for chaplains. All classes will run from 9am to 1pm at the University of Queensland, St Lucia campus. Students are required to attend all of these classes, to participate in the discussion and the skill building exercises, to complete assigned reading, and to complete two written assignments (a short report on a temple visit and a take- home exam). There are no fees for this course; all tuition and reading material is provided free of charge by the QSA. Students who successfully complete the course may be eligible to apply to the QSA for registration as Buddhist chaplains. 1. completion of high school or equivalent, or a higher qualification. However, students who have a good basic education and life experience in helping work are also welcome to apply. 2. good proficiency in written and spoken English. For further information about this course – or an application form – please contact Dr Barbara Sullivan by email barbara.sullivan4005@gmail.com. 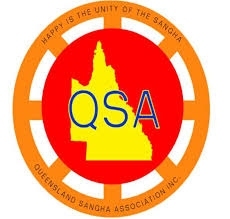 The information pack for this course for 2019 is in the QSA website www.sanghaqld.org Please see in the list of documents in the Educational Services section of the website under Services.